London is a glorious city. A hub of creativity and flair, the streets are imbued with history and green spaces thrive whatever the weather. However, this capital of art, culture and food is particularly spectacular when the sun shines. So, with a heat wave looking to descend upon us (as summer finally rears its warming head) we've been pondering how to best spend our sun-drenched moments. Yes you could picnic or day-trip or you could do something just a little bit decadent - a scrumptious lunch in the sun. Here is a selection of London restaurants you're going to adore rain, hail or shine (but especially shine). St James Park has always been a swan and pelican-filled gem. A stone's throw from the Thames and the allure of Whitehall, here afternoons disappear and the London of yesteryear lives on. Within the capital's oldest Royal Park you'll also find the refined and inviting Inn The Park. With an eco-friendly design and summer menu that pays its respects to fine British fare, the entire experience proves innovative and fun. Meals are vibrant, the rose wine come with a hint of France and the setting is perfection - this is part of the Peyton and Byrne family after all. Open from breakfast until dinner, here you can appreciate the rays in gourmet style. The Friday night I found myself within The Terrace of Rocket in Holborn, the sun was in full force and Lincoln’s Inn Fields was brimming with barbecues and post-work Pimms sippers. Staring into the vibrant greenery, the London stone facade glowing behind me, I felt thoroughly content - and that was even before the cocktails started flowing (if you want a whiskey sour done right, venture here). The atmosphere is relaxed yet elegant and the menu, which seems to take its inspiration from across the globe, is tempting in the extreme - it's odd, even on the warmest of days it's difficult to pass up a stone baked pizza. Having said that, the halloumi & chorizo kebab, on mooli, green mango and cucumber spaghetti with sweet roasted piquillo pepper dressing was something rather special and sure to spice up any Friday. However it was the key lime pie that really won me over - if you've got a sweet tooth this is the venue for you. 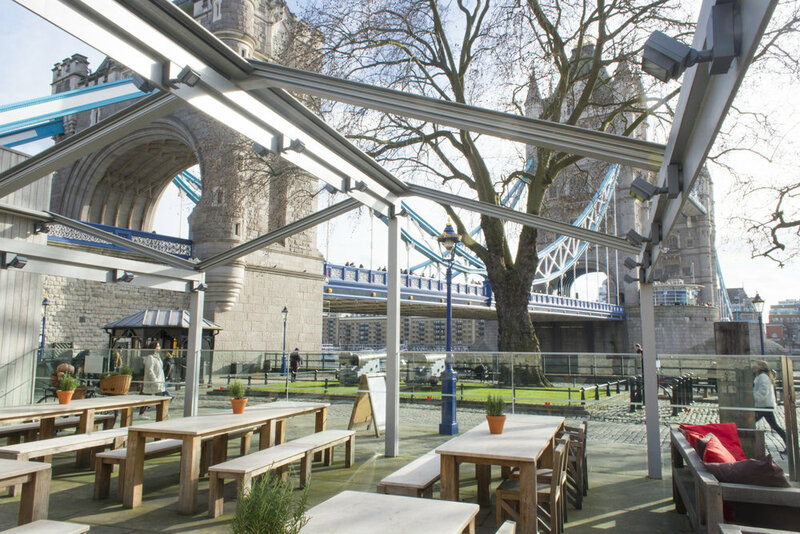 Nestled into the foundations of the Tower of London is a venue with a knack for cocktails and capturing the London sunset. This stunning restaurant, made up of a cosy, dimly-lit bar complete with Alice in Wonderland-style bottles, spacious indoor dining area (complete with floor to ceiling windows) and a terrace made for sun worshipping. Subtle Chaucer reference fill the space - the restaurant does after all take its name from one of his greatest characters. The Reveller appears is The Cook’s Tale and loved to eat, drink and dance as often as possible - a London restaurant god if ever there was one. But back to reality, the fare served at Perkin Reveller is fresh, flavoursome and delightfully British, accentuated by a diverse array of wine and cocktails (and floral post-dinner teas of course). What is special about this venue though is the staff, friendly and knowledgeable, they effortlessly guide you through the menu (made up treats like sloe gin cured salmon and creedy carver duck breast) and make you feel like you're dining with new friends. Meals come with in jokes and smiles and that only makes this summery experience all the more warming. Of course there are other wonderful sites for those who like to eat in the sun. The seasonal Towpath Cafe is constantly packed with locals wanting to make the most of the Regent's Canal, with The Narrow Boat offering a similar sun-dappled watery vista. Caravan In Exmouth Market is ideal for those who like breakfast outdoors while The Terrace at Orrery comes with plenty of Marylebone charm. Whatever you hunger for, know that London is more than happy to dish it up - and throw in a patch of sunlight for good measure.